God continues to use Samaritan’s Purse across this troubled nation. A fierce armed conflict erupted last year and forced people in southern Unity State to flee to the swamps. To evade detection and escape the violence, they were always on the run, shuttling from one small island to the other. For food, they scavenged water lily roots. When hostilities quieted down last September, most returned, only to find their homes looted and their livestock stolen. Since they missed their planting season, they’ve become dependent upon these monthly food distributions. Mammoth planes are needed to airdrop the 32 metric tons of food because fighting has made the roads inaccessible. Our teams organize the bags—filled with sorghum, split peas, and vegetable oil—then distribute the food to the 69,000 people arriving for their 30-day allotment. These distributions are a vital part of our outreach to these hurting people. But we don’t stop there. We’re drilling new wells and fixing existing boreholes to ensure clean, safe drinking water. We’re providing sanitation and nutrition services to safeguard the health of the most vulnerable. And our work goes even deeper—to provide spiritual food. We’re teaming with local churches to teach members to read the Bible, to lead peace-building workshops, and to train trauma counselors who help people overcome the atrocities they’ve suffered. As we work, we thank God for opening doors to present the Good News and to disciple new believers. 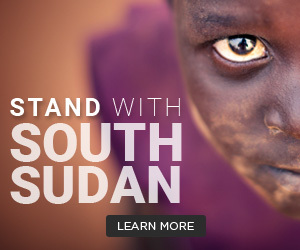 That’s true across South Sudan. Samaritan’s Purse has been dedicated to serving the people there in Jesus’ Name for decades. We helped rebuild 512 churches across the country that had been destroyed by the Government of Sudan and expanded a hospital in Maban County, the only healthcare facility that remains open in the midst of the fighting there. And many people are becoming faithful followers of Jesus, including Muslims. Juma is one of them. Noticing Juma’s hard work and desire to develop new skills, a Samaritan’s Purse staff member at Yida Camp spent Saturday mornings teaching the young man different computer programs. He peppered her with questions about Christianity. Then he began attending our showings of the Jesus Film. Convinced of the truth of John 14:6—“I am the way, the truth, and the life. No one comes to the Father except through Me”—the 20-year-old committed his life to Christ. Praise God “who is able to do far more abundantly than all that we ask or think” (Ephesians 3:20, ESV).